The Chart of the Day is Ingredion (NYSE:INGR). I found the stock by sorting the All Time High list for the stocks that had the most frequent new highs in the last month then used the Flipchart feature to review the charts. 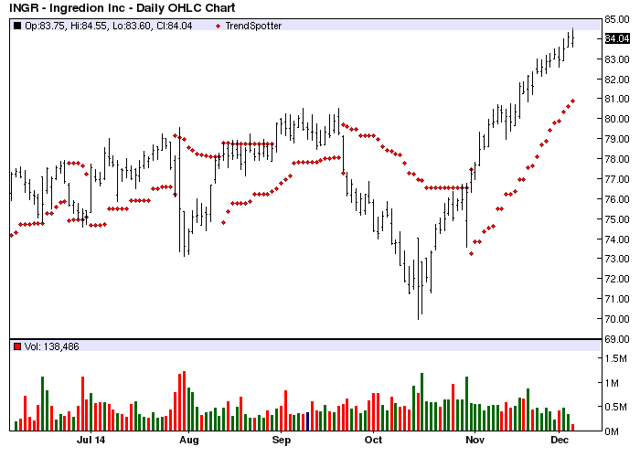 Since the Trend Spotter signaled a buy on 10/31 the stock gained 8.70%. Ingredion Incorporated is an ingredients solutions provider specializing in nature-based sweeteners, starches and nutrition ingredients. The Company serves diverse sectors in food, beverage, brewing, pharmaceuticals and other industries. Its sweetener products include dextrose, glucose, polyols, HFCS and Maltodextrin. The Company’s nutrition solutions include prebiotic fibers, resistant starch, soluble fibers and Inulin fibers. Its starch-based products include both industrial and food-grade starches. Barchart’s Opinion trading systems are listed below. Please note that the Barchart Opinion indicators are updated live during the session every 10 minutes and can therefore change during the day as the market fluctuates. The indicator numbers shown below therefore may not match what you see live on the Barchart.com web site when you read this report. Recently the 20 – 50 day MACD Oscillator has been the most consistent technical trading strategy for this stock and should be used as an exit point.